Part of my experience at the Bread Making Day hosted by Taste Glacier was learning how to shape rolls. I usually make round or oblong rolls, or I use my mini loaf pan to make mini bread loaves. I must say that I use more than the 40g of dough recommended to us on the day and I will continue to do so. If I am going to eat a roll, I want more than two bites. The first shape we learnt was a knotted roll. These are so easy – all you do is roll out a sausage shape and then create a loop and push one end through the loop to make a knot. We also learnt how to make ‘snake’ shaped rolls by rolling the ends of the sausage in opposite directions until they meet in the middle. 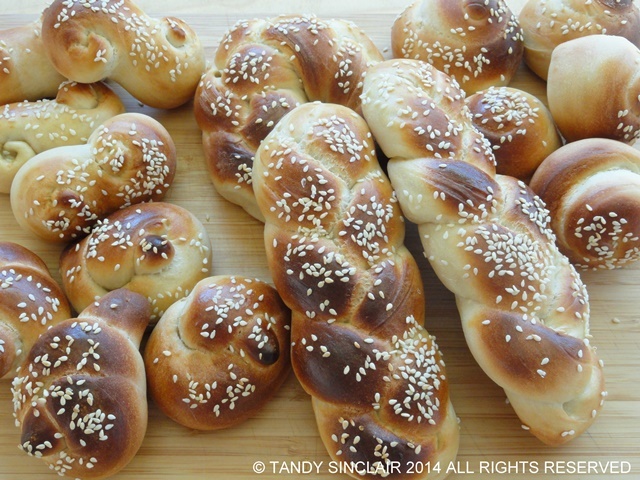 We made braided rolls which I love doing as they look so pretty. I usually do a three braid roll, just like you would braid someone’s hair but one day soon I would love to try an 8 braid loaf. If you follow this recipe below for sweet potato rolls be advised that the salt goes mad when you put it into your mixer. I use a cover which I can highly recommend. James loves sweet potatoes and I had bought some for him when we went overseas. One was left uneaten and I had hoped to use it for the bread rolls, but before I could blink it had grown leaves and sprouted shoots. I have planted it and after a few months it has finally grown and the leaves are abundant. Hopefully it will produce a nice handful of sweet potatoes. These look fabulous! I bet they’re absolutely divine with some jam and a nice pat of butter! What beautiful looking rolls. Love the addition of the sweet potato. Talk about gorgeous bread. I love the aroma of bread baking. I have only eaten sweet potato bread once and never gave it another thought until I read this post. I agree, the aroma of bread baking is something to love! These sound great Tandy and I agree, I also want more than a couple of bite. I must admit to using copious amounts of butter too! I’m so amazed at the color of the dough. I would’ve thought it would have an orange tint of some kind. 🙂 They look beautiful though! lovin it with a side of omelette and crispy bacon for breakfast…. These sound intriguing and they look beautiful! these rolls are adorable! great addition of sweet potato! Tandy, they’re so pretty! I love the S-shaped ones!! Waw, what a great sweet potato bread rolls recipe,this is! I love how you rolled them up so nicely! I don’t know idfI can do that too! These breads are just gorgeous! Love that bronze color and I bet your house smells amazing!